If we’ve learned anything from Goldilocks and the Three Bears, it’s that we should strive for “just right,” no matter if it’s porridge or home prices. After all, if they’re too hot, a correction surely looms, and if they’re too cold, it means something isn’t quite right with the housing market and the economy at large. Fortunately, home prices finally seem to be settling into long-term fundamentals, according to the latest edition of Trulia’s Bubble Watch. The real estate portal’s chief economist Jed Kolko noted in a blog post that home prices were only three percent undervalued in the second quarter, which tells us all is still good over at Bubble Watch. Yes, there were signs we were headed right back to 2006, seemingly forgetting lessons learned just years earlier, but then accelerating home price gains abated. Sure, home prices are still on the rise, but the pace is a lot more gradual, which as the title of this post suggests, is a good thing. At the worst of times, back in the first quarter of 2006, home prices were 39% overvalued according to Trulia. We all know what happened next. About five years later, we hit bottom as home prices were considered 15% undervalued in the fourth quarter of 2011. Since then, it’s been a white-hot housing market, that is, until the past few quarters as reality finally caught up with us. 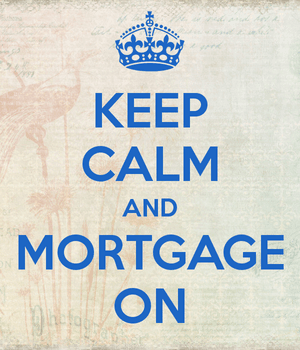 Now we’re on pace for a perfectly valued housing market by the final quarter of 2014, or perhaps the first quarter of 2015, though we still remain slightly undervalued. In the first quarter, home prices were five percent undervalued and they were eight percent undervalued a year earlier. The only caveat here is that artificially low mortgage rates might be throwing the numbers off a little bit, but if rates stay low for a long time that shouldn’t be an issue. As it stands, we’re only 79% back to normal in terms of whether home prices are under or overvalued. But a year ago we were 44% back to normal, so if we continued on that pace we’d swing too far the other way. Heck, even a quarter earlier we were only 68% back to normal, so you have to wonder what the rush is. The good news is that as we approach “normal,” home price gains are slowing, meaning they should be sustainable as we reach that sweet spot. In fact, for the first time in nearly two years no local housing market has registered a year-over-year gain of more than 20%, so even the really, really hot markets are cooling off finally. Again, home prices are still rising, but they’re climbing at a more normal pace, which is good for housing long-term. At the same time, there are still markets that are getting a tad frothy, and those that have yet to ride the national housing train higher. If you look at home prices relative to the fundamentals (historical prices, incomes, rents), Orange County, California was 17% overvalued in the second quarter. While that might seem high, consider the fact that OC home prices were 71% overvalued relative to fundamentals back in the first quarter of 2006. It’s not to say that home prices there have plenty of room to run before we can all jump ship and make a tidy profit again, but it does give you some perspective if you’ve got returning bubble fears. 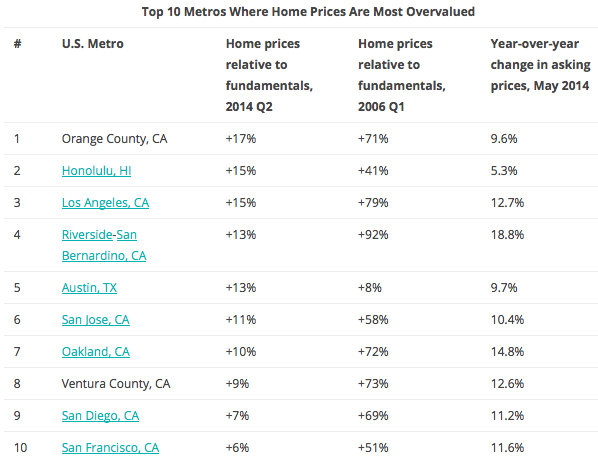 Perhaps more disturbing is that eight of the 10 most overvalued metros are located in California, with Austin and Honolulu the only outsiders. On the other end of the spectrum, it continues to be the Midwest that is undervalued, even with the spectacular home price gains realized over the past couple years. 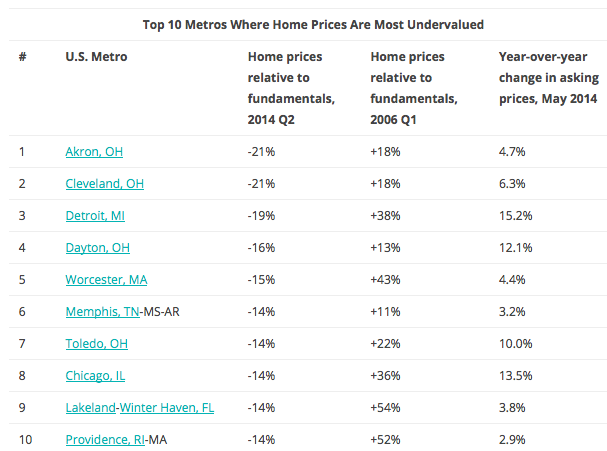 The metropolitan area of Akron, Ohio is still 21% off if you consider the fundamentals, though it only ever climbed 18% above where it maybe should have during the prior boom. Four of the bottom 10 metros can be found in Ohio, and of course Detroit is on that list, despite being an underdog story going forward. Nationwide, 76 of 100 markets are still undervalued per Trulia and those that overvalued are only “just a bit” beyond where they should be, which means we don’t need to hit the panic button just yet.